I am not a person who gets excited by gear. In fact, gear often deters me from even getting into a hobby in the first place. When I began to learn to rock climb, all I ever wanted to do was slap on the shoes, and boulder around… the idea of knots and ropes and carabiners completely turned me off. Skiing is a blast, but prepping for the skiing is a royal pain for me. Poles and gloves and hand warmers and boots… Ack. So, it’s quite strange, that I’ve become so into the photography thing and get excited about things like lighting fixtures, lenses and, even more so, tripods. Tripods are the ultimate accessory for the gear head. They come in a plethora of material and weight configurations with different components for attaching, spinning, leveling and positioning. Perfect for those who want to spend hour searching away on forums to find just the right equipment. But, even if you, like me, aren’t all that into gear, you need a good tripod. Even if you are using a point and shoot. If you’ve ever worried about whether you had enough light for a shot, or read your light meter and noticed shutter speeds considerably below 30, a tripod will set your mind at ease. Use one for a week, and you’ll be amazed at the difference in your photos. It’s the only way you can get predictably sharp results in your food photography. Or, at least, it’s absolutely critical for those of us who drink caffeinated beverages and can get a bit shaky at times. However, using just any tripod doesn’t guarantee you complete stability, particularly as you start dealing with heavier camera bodies and larger lenses. I’ve been shooting with a lightweight hiking tripod for a few months now, and each time I touch the camera to make a small adjustment, I have to let it “rest” while I stand perfectly still so I don’t introduce more shake. In addition, whenever I position the camera with my heavier lenses… my 180mm in particular, but also some with my 100mm… it slowly creeps down, and out of position. I say slowly because I can’t see it moving, but really, in shutter speed time, it’s moving quickly, enough to introduce some blur that I don’t want. As you move up the quality (and price) chain, you start getting options that give you better stability, easier access and greater precision. You’ll buy the head separately from the legs, and you’ll need to understand what the different options are for both. There are basically 3 different types of heads: 3-way heads, ball heads and gimbel heads. Gimbel heads (like this Wimberley) are one of the best choices for anything that you are using very, very heavy lenses on, as they provide an extra support. And when I say very heavy lens, I mean 400mm+. You really don’t need these for food photography and I only mention it here in case you stumble upon them as you are researching. A three way head is the simplest construction, and has different knobs for adjusting the camera position… one to pan horizontally, one to move front to back and one to move right to left. There are some benefits to this approach beyond price… you can lock in two dimensions and just adjust one. But, it’s also a lot more futzting, and I find that I often end up needing to readjust in multiple ways, creating more hassle than advantage. Still, the three-way heads are a good affordable choice. Finally, we get to the ball head. The ball lets you adjust any which way with one main knob that can rotate forward, backward and pan precisely where you want to with a single movement, and another for panning horizontally only. The variations you’ll see in ball heads have to do with the amount of weight they support, and how smoothly and accurately you can position them. 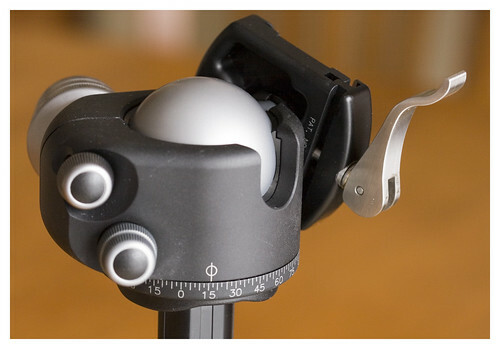 Manfrotto has an interesting grip action head that lets you simply pull a lever to move the camera position instead of tightening and loosening a knob. However, one of the benefits of the knob approach is that you can make it “almost tight” and make more precise adjustments. For years, the Arca-Swiss Monoball B1 was considered the top of the line for ball heads. However, Really Right Stuff’s BH-55 has become one of the new favorites. And, as of last Wednesday, this is the head on my new tripod. I’ve now shot with it about 3 times, and it’s absolutely gorgeous. The movement is like butter. It stays where I want it. There is no jiggle. In addition to the head, you will want to get a quick release plate if you ever want to take your camera with you anywhere outside of your studio. The quick release plate has a piece that screws onto the top of your tripod and one that screws onto the bottom of your camera. 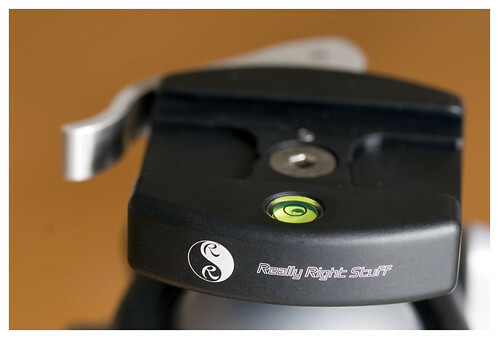 The plate on the camera fits into the clamp on the tripod, and releases easily with a lever. Really Right Stuff makes a great one that has a nice safety feature that keeps the camera from accidentally sliding off if the clamp gets opened unexpectedly. It also has a level, which is probably really useful, but that I generally ignore. Next, are the legs. Legs are made from many materials that vary widely in both weight and stability. The top of the line are carbon fiber legs. These are light(er) weight but still incredibly stable. If you are transporting your tripod around a lot, it may be worth investing in a set. However, for studio work, weight is really less of an issue. I’m using the aluminum Manfrotto Pro series, which weight a bit over 5 lbs, but are amazingly sturdy. Beyond their materials, leg sets have a variety of different options. You can get 3 section or 4 with the ability to lock into different angles, a knob or a crank to raise or lower the center bar, a built in level, and accessories to allow extremely low angle to name a few. My favorite feature of the Pro series is that the center bar that can be inserted horizontally to allow you to take shots from directly above your subject easily. 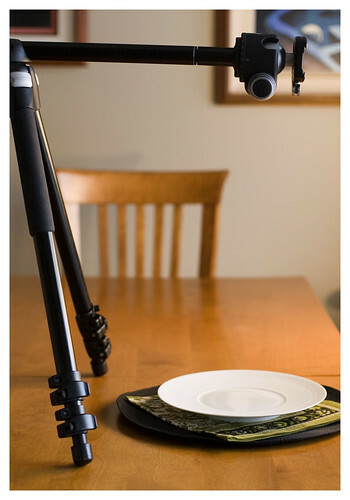 For food photography, this is incredibly useful. 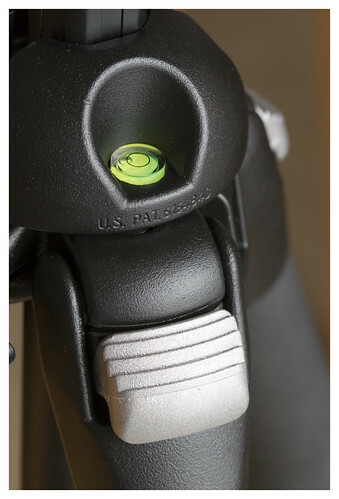 The top of the line system, including a ball head, quick release plate and great legs will cost you about $1000. It’s not cheap. But, you will see a dramatic difference in the quality of your photos. For those of you, like me, who love a good rationalization as to why you should start at the top, there’s a great article here on the steps he sees almost all amateurs go through, and how you can “save” money by just getting the good stuff to begin with. I recommend renting or borrowing a couple of different configurations before you purchase to make sure it will meet your needs. Does the tripod hold your camera in place with your heaviest lens on? Does it get into the positions you care about (does it go high enough, low enough, and in the right angles)? Is it sturdy enough that you can’t easily knock it over when your hands are full, and you are trying to position the food in front of it? The rest, like how quickly it can change position and how smoothly it moves, is personal and tolerance level. Oh, one more thing. As long as you are investing in a tripod, you may as well do everything in your power to minimize shake in the camera. As soon as your hand touches the camera, you introduce shake. To prevent that, you need a remote. I use the most basic Canon cable release whenever I’m using the tripod. There are very cool, higher end wireless remotes that do all sorts of fancy thing… but you really just need something that lets you click the shutter without touching the camera. This entry was posted in Photography Gear, Tripods. Bookmark the permalink. Great blog, thanks for sharing! You should check out the Gorillapod! Thanks AJ – I have to thank my husband for a lot of this info… the tripod I got was a gift from him for my bday… I had to go research it after the fact… luckily he got me an absolutely bomber tripod! 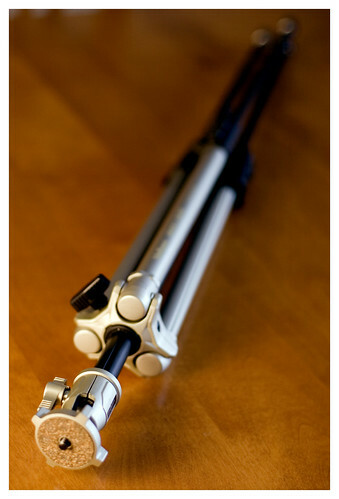 I’ve just bought my first proper tripod using the fantastic advice in this article – thanks L! My tip to add would be to go and make friends with your local camera store. I thought I knew exactly what I was going to buy but decided on a whim to go and look first. When I got there I found out that the tripod I had nearly ordered online just wouldn’t have been tall enough to get the angles I wanted and that there were other heads much suited to my little hands than the one I had in mind. Happily the store also sells online so their prices were very competitive. Oh, boy, there’s so much to know. AI’m a totally new beginner level here. Do you recoomend any good and honest photo shop in Seattle/Eastside (or do u buy everything online? After my class with Clare today I am itching to get a new tripod for shooting straight down. I am so happy I found this as it is great to find all of the pertinent information in one spot! Fabulous studio space by the way! Any tips on where to get some of this gear used to save $$? Hi Lauren – you could always keep an eye on ebay for bargains, but tripods are one of those things that I’d be a little wary of buying used unless you know the source well. While well cared for, a tripod and good head should last for years and years, a lot of them get pretty beaten up. One good source for used gear is Adorama. Mostly they sell new, but when they get used gear you know it will be checked out well, and they have a good return policy.